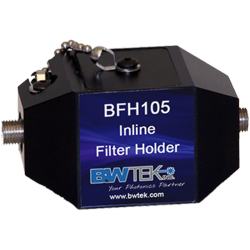 The BFH105 inline filter holder is designed for fiber coupling and ease of handling. It can hold up to three standard filters (1inch in diameter, 5mm thick - not included). The BFH105 has two SMA 905 fiber connections and can be used with any fiber coupled spectrometer and/or any light source.